Gentle 59 Multifocal Tórica Vision at all distances even with astigmatism! In Prodevisión, online optics, you can find offers of Gentle 59 Multifocal Toric progressive contact lenses, the only contact lenses on the market that correct myopia and hyperopia up to 30 diopters, astigmatism up to 8.00 diopters, in addition to correct presbits of up to 4.00 diopters of addition. The Gentle 59 multifocal toric lenses, have an individualized design for each eye, in all existing parameters, that is, radius, diameter, sphere and addition. This results in a fully adapted lens for each patient's eye, thus ensuring quality of vision and comfort throughout the day. Thanks to its high manufacturing technology, they can correct astigmatisms of up to 8.00 diopters, opening possibilities to many patients who have always wanted to use contact lenses and have not been able to because of parameter limits. This contact lens is the only one on the market with these characteristics. Thanks to its high manufacturing technology, with the Origin Technology material, this contact lens offers wettability, with a low coefficient of friction. 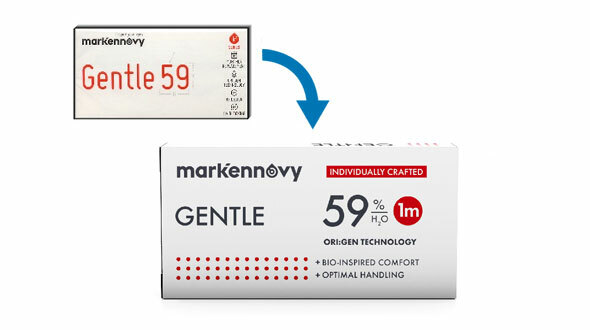 Gentle 59 progressive lenses have a multifocal design based on a CD-CN geometry, that is, far away center or near center depending on the needs of the patient, ensuring a great quality of vision in both distances, so necessary to be able develop daily activities. When buying Gentle 59 Multifocal Toric lenses in Prodevisión, it is necessary that the lenses have been prescribed by an Optical Vision specialist or Ophthalmologist, from there, you must place your order by copying the parameters of the last contact lens case that you have acquired, that is, the first adaptation has to be done by the professional who will assess vision, movement of the contact lenses in the eye and also teach you the correct handling and maintenance of the lenses. It is important to mention the maintenance fluid, usually called a single solution. This should be of quality (first mark, all liquids are not equal) and if possible always use the same, a change of liquid can cause serious problems in the use of contact lenses. In Prodevisión we have the first and best brands of maintenance liquids on the market that assure you that they will take care of your eyes and your Gentle 59 Multifocal Toric lenses with all the guarantees.